In one film, a shot is accidentally fired in the teacher’s lounge after a standoff over a plate of complimentary blueberry muffins. In another, a teacher uses his gun to intimidate a bully in the hallway. Then he and a colleague reminisce about how all they could do in the past was just send kids to the principal’s office—before complimenting another teacher about his new Glock. A third spot sees a teacher go back and forth with a student on a math problem. She’s not a great educator, but we soon learn why she was hired anyway. 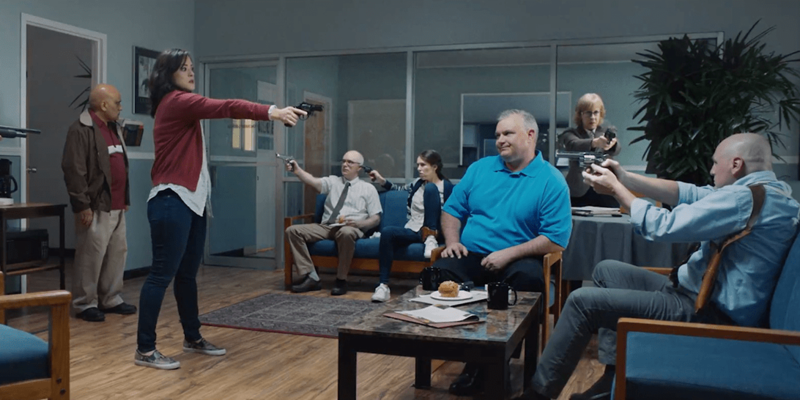 The videos, created by writer and producer Joel Surnow and production company Station Film, use dark humor to get their point across and pack a punch by bringing absurd situations to a proposal many find absurd to begin with. Each film ends with the message “Stop The Madness” and asks viewers to visit VoteEmOut.org, which has more information about the campaign.